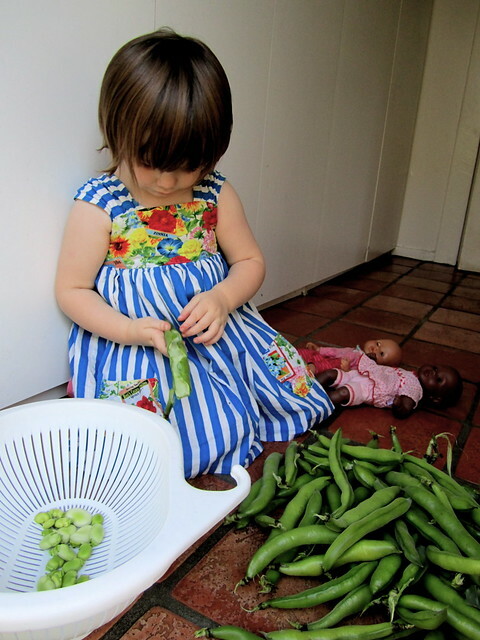 Because Fable helped plant the beans, I've been having her help me pick them, specifically shuck them, which she is so pro at by now I'm almost sad that Fall veggie season is over (although, today my mom is here helping me plant our summer garden because I'm twelve and need my mommy). 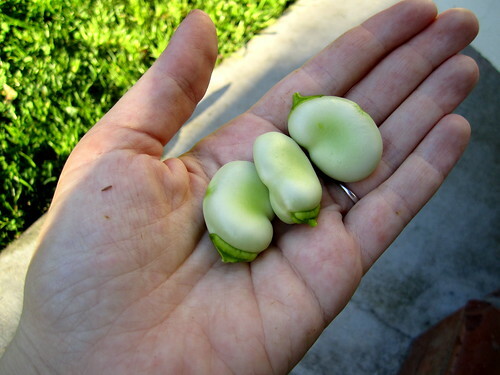 Next Fall we will absolutely plant Fava beans again and dine on them as we have been these last few weeks. 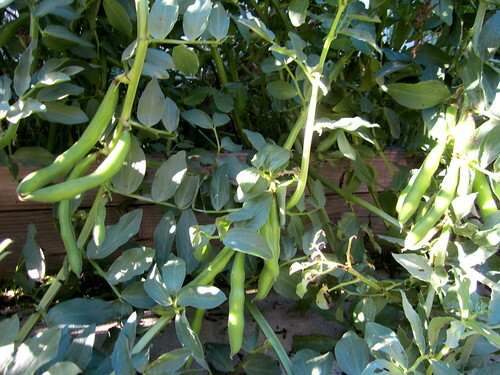 Fava bean plants almost six feet tall! 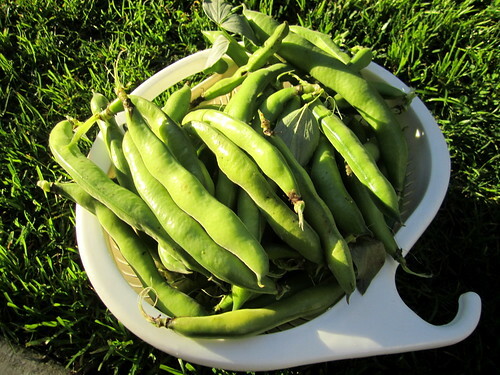 One must pick MANY to feed a family of four, because each pod only holds about four beans and although they start out pretty large, they will soon shrink before your very eyes! I passed the bounty off to Fable who sat quietly and shucked every. single. one. On this particular day, Hal and Archer were out renting a movie and I got this tremendous feeling of hunting vs gathering - the boys out hunting for our Friday night movie as Fable and I prepared dinner. Sexist? I prefer the term, "ancient". Plus, there's something to be said for women bonding in the kitchen. (Last week we went to see African Cats at El Capitan and I was struck by how MUCH women bond over food. 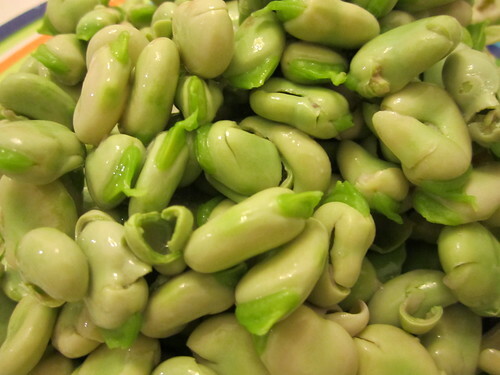 Our Fava beans = their Zebras, but you know what I mean.) In the wild, we are a team. I love that. 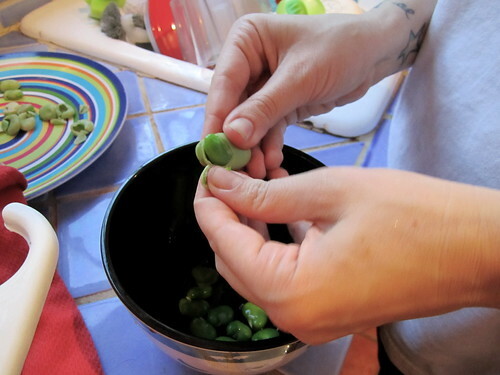 Anyway, for an hour Fable shucked Fava beans and I took photos of her. 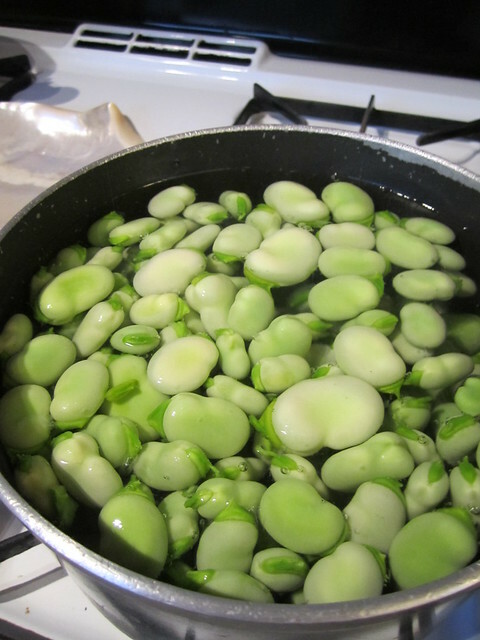 You'll need: Fava beans (obviously), salt and butter, boiling water. And fingers. Ready? Let's do this. 1. Sprinkle a few shakes of salt in a pot of water. Bring to a boil. 2. 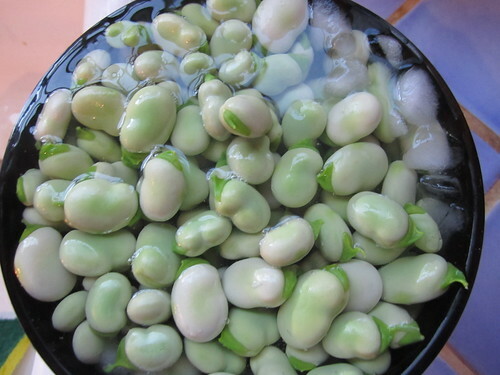 Pour raw Favas (Ravas) into the boiling water. Let boil for ONE MINUTE ONLY! 5. 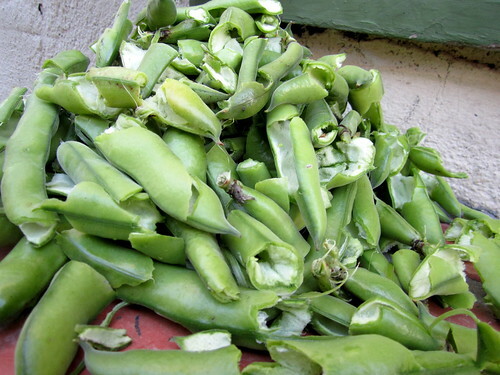 Once Favas have cooled, peel back the foreskin? I don't know what else to call it. This will take many, many minutes. Archer likes to help me which means... it still takes many, many minutes. 6. 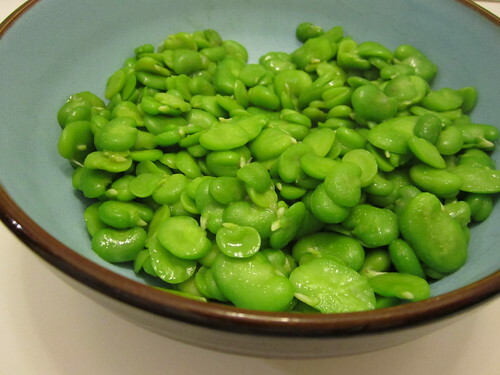 Once Favas have been peeled, throw them in a pan with spoonful of butter (aka, use your discertion. A little butter goes a long way with these suckers). 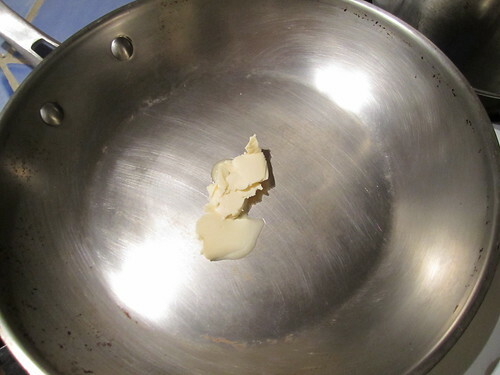 Cook with wooden spoon for two minutes. 2. 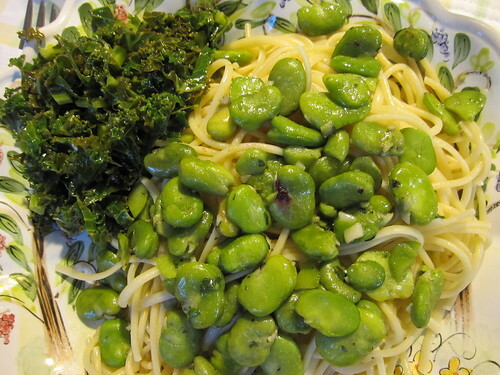 My mom recently served hers on a bed of pasta (cooked in olive oil & LOTS of garlic) which she said was delicious. Thanks for joining me this week! I know my mom is a thousand times better at this than I am so once again, I'll be letting her take over from here. P.S. And this has nothing to do with Fava beans-- for those planning any family trips to Los Angeles this summer, here are some of my top recommendations for Family Friendly hot spots in L.A (via Family Finds). P.P.S. This doesn't have anything to do with Fava beans either: It is however an interview I did with The Inside Source for Mother's Day. Read if you'd like! P.P.P.S My mom will be unable to post next week c/o of her jet-setting to the Mayo Clinic to hopefully figure out what has been ailing her these last few years. Let's all send her positive vibes so that the Mayo doctors can (hopefully!) figure out how to make her feel better. So far, everyone she has seen has done little, if anything to help her and more than anyone I know, she deserves to be healthy, happy and back to her pre-autoimmune-disease-ailing-self. Amen. That is a stunning broad bean jungle. I've never seen the plants so huge! Those beans look so HUGE. 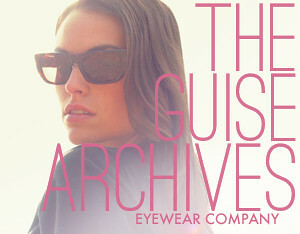 I will plan to try them soon. Also - I have never heard the term "chucking". We say "shucking" here. I wonder if it's actually a different process or just a difference in terms because of our locations? I'm from the Midwest. wow, what a load of work but they do look delish! sending thoughts of healing to your mom. if she is looking for a stellar alternative route she should check out Theresa Vernon- she's slowly but surely helped me out of my own autoimmune mess, (i tried many other routes before finding her)- really an absolute genius when it come to helping people get better. Just thought i'd pass the her name along. Yum. The pasta with garlic and beans sounds delish. 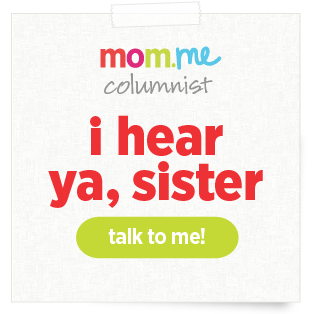 Positive thoughts of healing to your mama! 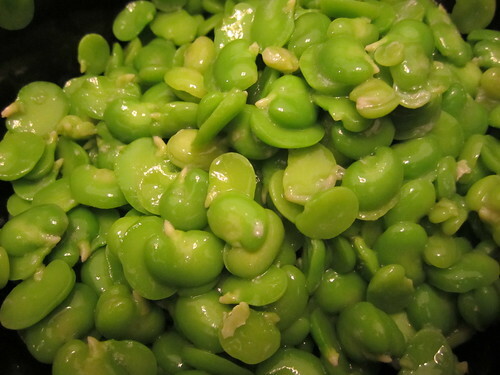 I made a fava bean rice dish at Passover this year with dill and garlic and lemon. It was delish. Also you can make soup stock with the pods. I just threw them in a pot with a quartered onion and some carrots covered them with water and boiled it for a while until the water had a nice color and fragrance. It was a great base for a white bean soup I made a few days later. Is your mom in MN? I work for Mayo Clinic in Rochester... If I see her on the street I'll be sure to say hello! And tell her where our co-op is located! What??!? Someone had to say it! This was a great eat well post! 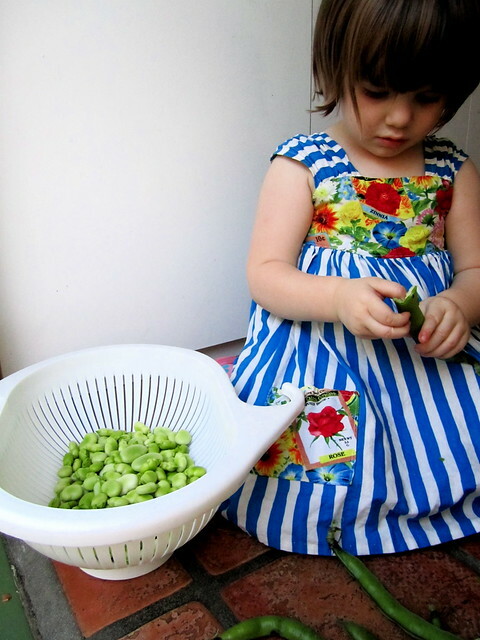 Fable shucking beans in her little seed packet dress is the cutest thing ever! 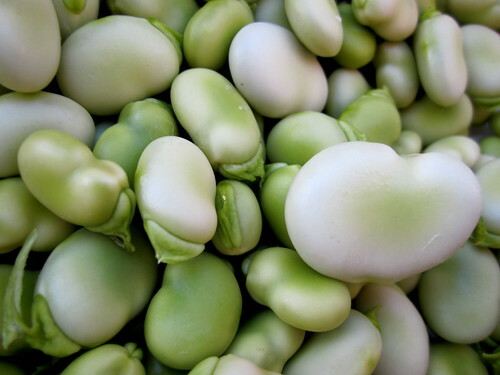 i saw favas at sprout's today. i'll have to get them next time. 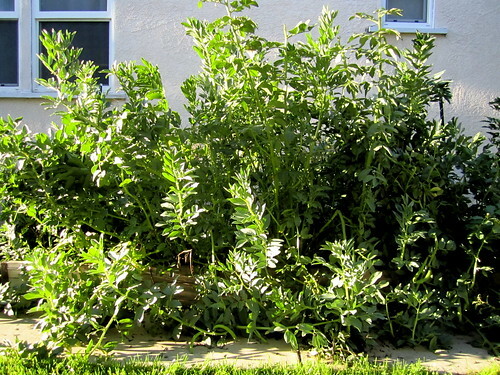 and will definitely add them to my winter garden next year. yum! thinking of your mama. if you're at the phoenix mayo be prepared for the heat, m'lady. it's h. o. t. up in here already, www. Sending good thoughts toward your mom! She seems so sweet. Maybe you can submit her to one of those doctor/medicine shows where they investigate mystery ailments. Holy cow- look at the how big those plants are. I remember watching the seeds going in the dirt! The earth is amazing! Hope your mom gets things sorted. 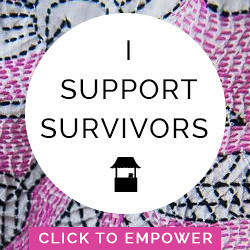 It took many years for my mom until they discovered she has lupus. All the best!!!! My little sister is moving to L.A so I am keen on family friendly L.A options but I cannot access your link! Any help? 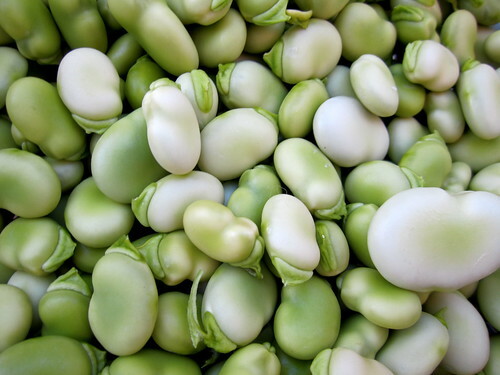 Fava beans cooked like that and pureed are super delicious! Hello! I am delurking to tell you that you are extra funny today. Foreskins! Ha. And I want to congratulate you on your upcoming babies! I have a six-month-old son who I'm crazy about and when I was newly pregnant I was hoping for twins (but I stopped telling people that when too many responded by staring in disbelieving horror). Yay babies! Suggestion from an Italian girl? Try them raw with a drop of olive oil, pieces of Pecorino cheese and a glass of white wine. Those plants are HUGE! 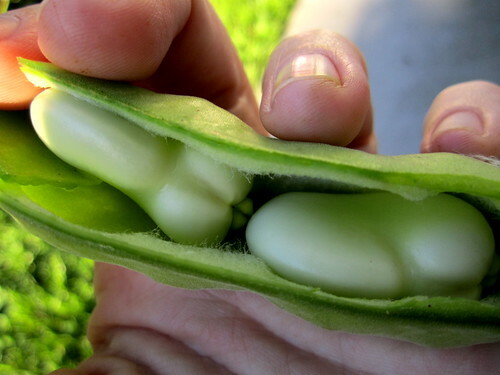 I had no idea favas got so big! 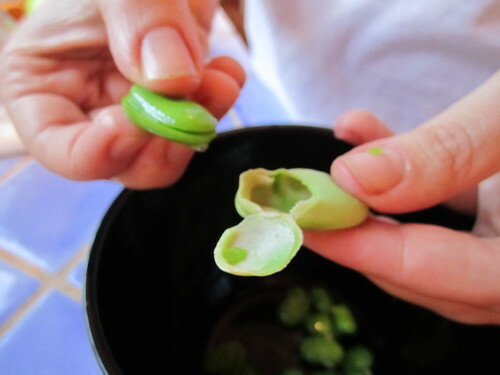 Rebecca, the foreskin of the fava bean is very edible. That's how we eat them in Portugal. 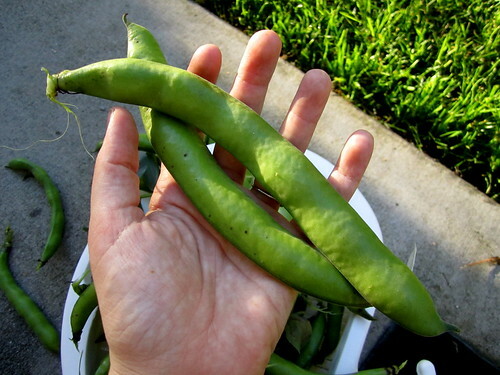 Tradicional recipes for favas are about steweing them (until they are very soft and tender), usually with some pork ribs and chorizo (you can also add carrots and other vegetables) and, upon serving, you add a lot of garlic and a low of cilantro. Perhaps you'd like to try a vegetarian take on this...I don't know how but perhaps you or your mom have some good ideas. Good luck to your mom, I hope she finds the help she needs. Huh! Good to know. I was told they make you gassy? I mean... they ARE beans, but they're also a very chewy consistency - not at all tender. But stewing them sounds like it would fix that problem. Good to know! Thanks for sharing, Helena! Please post that list of baby names you guys were considering before you knew the sexes of the babies. My husband and I are struggling for unique boys' names! Thank you for all of your posts. 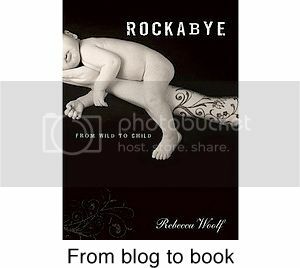 Thank you for providing a like minded voice on parenting and life to read regularly. I am truly grateful. You killed me with that foreskin thing... I need bleach for my brain now. Thanks very much. 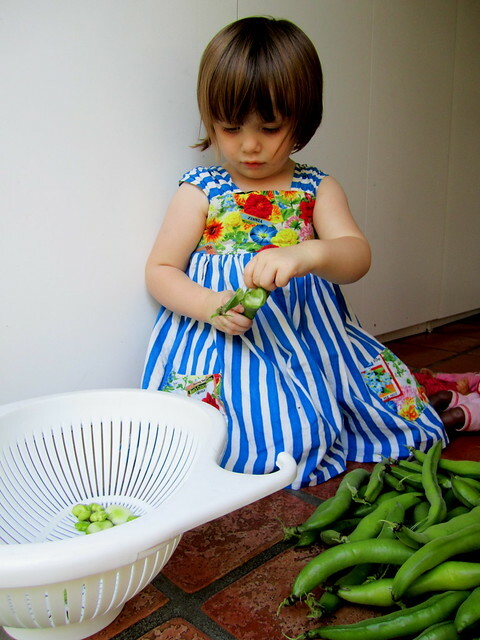 My daughter is almost 3 and I would never ever be able to have her sit still for almost an hour to shuck the fava beans =) well done in making your kids involved in homey activities at such an early age. And I'd like to recommend you the Fava Bean Pate. It's a turkish dish. 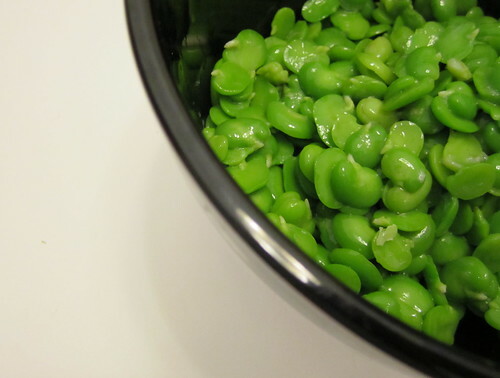 Simple recipe: boil skinned fava beans, an onion, a carrot and some garlic in a pot. The water should be enough just to cover the vegetables. Cook in medium heat, until everything's softened. Last 5 minutes, add some olive oil. salt and pepper -if you like-. and mix it with a blender until smooth. Still hot, pour the mixture in a flat serving bowl. When it's cold it'll be hard enough to let you cut into any shape you like. Fresh lemon juice and dill is a must when serving. 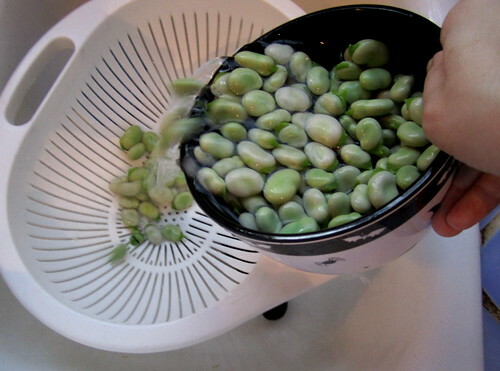 I'm not sure if you have them, but you can do the same with dried Fava Beans. You just have to soak them in water and let rest overnight . 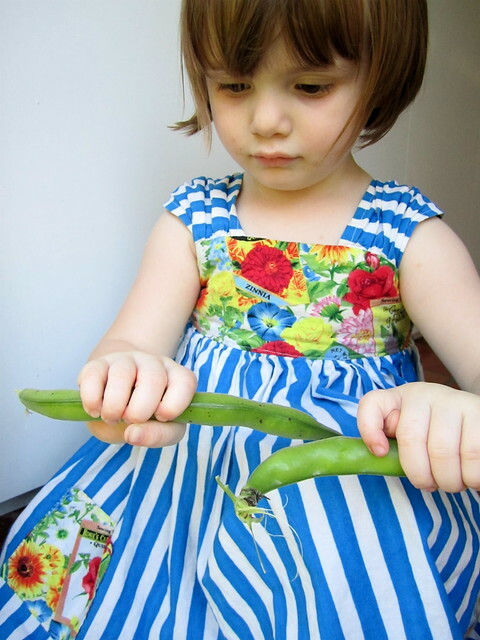 wow, good for Fable, shucking those beans. My kids would lose interest after about 5 seconds! I am sending pos vibes to your mama...hopefully they can find out what's wrong so she'll feel better! I'm planting some of these for us NOW! Or do I wait for fall? 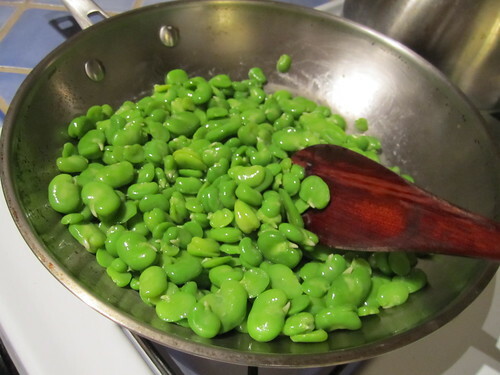 I've been cooking these for a few weeks and then whirring them with the immersion blender and some "fava bean water" from the boiling; add salt & pepper and some crackers~YUM! Hope your mama gets some good news soon!